Look at the first images of the video below and tell me if you see the same thing than I do. It’s the ‘All Seeing Eye’ appearing in the middle of 3 chemtrails forming a triangle in the sky. Proof enough that the Illuminati uses this new strategy to suppress, dumb down and fundamentally poison the masses using the air we breath. To explain the relation between the Illuminti and the chemtrails, here a great text by the IlluminatiAgenda. this to be a completely normal sight and will probably actually expect to see the blue sky broken up somewhat with the white trails of the passing air traffic. There is one huge problem with this however and that is, that the majority of the white trails seen in our skies today are not the harmless natural vapor trails that most likely view them to be but are synthetic, aerosol based, man made chemical trails (or chemtrails) that are purposely being left in our atmosphere for us to subsequently be exposed to. There is a huge difference between the natural contrails (or condensation trails) of ice crystals and water vapor left by commercial jets that quickly disappear after they have flown by and the thick, white, looming chemtrails that we are increasingly seeing lurking in our skies nowadays. These chemtrails don’t quickly disperse like the natural vapor trails but linger in the sky for hours, slowly widening and descending in altitude. As more trails are ‘laid’ they begin to merge with each other during the course of the day until finally they end up fabricating what looks to be a completely natural cloud cover as the lines of the trails can no longer be properly distinguished. Within a few hours to half a day, what was a beautifully clear, bright blue sky is transformed into a complete ‘white out’ – a thick artificial haze that completely blocks out the sun and by the end of the day reaches ground level. descend regardless of the climatic conditions or geographical location and are mostly (yet not exclusively) left over built up areas in a criss-cross grid like pattern which seems to allow them to merge far more quickly and effectively. They create a ‘veil’ in much the same manner as how the illuminati create a veil of illusion over us in the other areas of our lives through their various institutions of control, yet unlike those mostly subconscious, subliminal and effectively ‘invisible’ veils, this one can quite clearly be seen! Military aircraft are used to spray the chemical concoctions from above but seemingly normal commercial airliners are also involved and these are either military aircraft disguised as commercial airliners or are in fact legitimate airliners following set flight paths that are being utilized by the illuminati to lay the chemtrails – most likely through additives in the fuel or modifications to the jet engines, without the knowledge of the pilot or staff of course. So effectively, as these commercial aircraft are traveling from destination to destination, they are serving to pollute and poison our skies, unbeknown to all those on board. As do we spray our fields of crops with chemical pesticides to ensure good productivity and high yields, the illuminati spray their cities and towns with toxic chemicals to keep the populations of them docile, subdued and subservient. In any state other than this we too are viewed as pests as we pose a distinct threat to their agenda. We are regarded as a labour force by the controlling elite and in the same way that crop yields are far better without the pests, so to is the effectiveness of the workforce without the knowledge or ‘pest like’ awareness of the true nature of their reality. Spraying from above helps to ensure that the workforce remains ignorant and serves to help prevent them from awakening to their servitude to the elite. caused by exposure to toxic chemical and biological weapons. The introduction of and increase in chemtrails has also been linked by a number of different researchers to an outbreak of ‘Morgellons Disease’ which was first identified in 2001 – just a few years after chemtrails seemed to begin appearing in our skies. Symptoms include unsightly and painful skin lesions that are unable to heal, extreme fatigue, memory loss, joint pain and other neurological disorders yet there is no ‘official’ known cause for Moregellons and not surprisingly it is mostly dismissed by the medical establishment and put down to paranoia and delusion. The idea here is to keep the people docile and their health undermined so that they become dependent on illuminati medicine and the pharmaceutical industry and thus pose little to no threat to the illuminati’s ongoing endeavors. It also links in with the depopulation agenda as the continued poisoning of our air would help curtail increasing population levels and bring about a more desirable and controllable number through both the disease and infertility it causes. Chemtrails also serve as a way for the illuminati controlled governments to ‘test out’ new biological weapons and laboratory created diseases quietly on the masses, using them as guinea pigs to gauge results before utilizing them either in full capacity or in other areas of the world. A government report released in the U.K and covered by ‘The Guardian’ newspaper revealed details of how between 1940 and 1979, it conducted germ warfare tests which involved releasing dangerous chemicals and microorganisms over large numbers of the population in secret. Military personnel involved were instructed to tell ‘inquisitive enquirers’ that the tests were merely part of research projects into the weather and air pollution. In the US, the 1977 Senate hearings confirmed that 239 populated areas had purposely been contaminated with biological agents between 1949 and 1969.
manipulates the electrically charged ionosphere that surrounds the planet to enable weather control and permit the triggering of so called ‘natural’ disasters in specific areas of the planet such as earthquakes and tsunamis – as we have been witnessing with increasing frequency over the past few years. The chemtrails act to fill the atmosphere with highly conductive metal particles and create a blanket that acts to conduct and direct the HARRP signals far more effectively and accurately. Another likely idea is that the illuminati are using chemtrails as a way to effectively block out the sun from us in a form of weather manipulation and ‘geo engineering’ as it is officially known, is already being utilized globally by scientists and meteorologists. 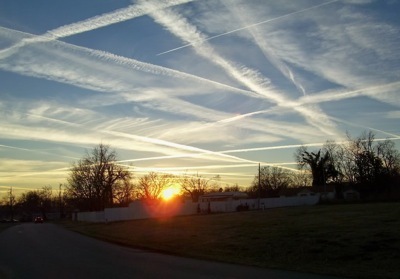 For example, chemicals can be sprayed into the atmosphere at high altitude to ‘seed’ the clouds in an attempt to make it rain over areas experiencing drought, or particles of metal can be released into the atmosphere to reflect and block out the suns rays in attempt to cool temperatures to combat so called ‘global warming’. Sunshine is critically important to us all – it allows the body to generate vitamin D for example, which is essential for the absorption of calcium in the body amongst other things and without exposure to enough sunlight people can often become depressed, lethargic and unwell – which is exactly what happens to those that suffer from ‘Seasonal Affective Disorder’, or put simply – not enough sunlight. The sun is also massively important to the illuminati and always has been – they worship it, much of their symbolism is built around it and the term ‘illuminati’ fundamentally means ‘the illuminated ones’, which obviously ultimately refers to light. transformational information given out by the sun. A final theory is that the chemrails are part of an overall agenda to take total control of our food source and completely rid the world of organic food production and the capability for people to grow their own food, in a classic illuminati ‘problem – reaction – solution’ style methodology. First, the illuminati systematically poison the worlds soil by releasing toxic metals into the atmosphere via chemtrails, so no crop can safely be grown in it, which then creates the problem of potential widespread global famine. They then introduce a ‘new’ type of genetically engineered seed that they have had developed for years that can grow ‘safely’ in the toxic soil but that couldn’t be introduced outright before hand as it would likely be rejected by the masses but now with normal seeds rendered useless, the people have no choice but to fully accept this new seed. The seed will have been highly genetically engineered and will essentially create ‘frankenstein food’ that once consumed will serve to fundamentally alter your state of being and create a more subservient, dumbed down and disease prone species that will serve the illuminati perfectly with no hope of ever awakening or evolving. Already, large amounts of trees (most notably in California but all around the world) have been apparently randomly dying and when a sample of the surrounding soil is taken, it inevitably tests positive for extremely high levels of barium and aluminum – which creates a toxicity in the soil that is absorbed by the roots and subsequently kills the trees. Also, the current food we eat will almost certainly be subject to contamination from chemtrails and so in this way the illuminati are already effectively contaminating our bodies with toxic metals through what we eat as well as the air we breath. It is most likely that a combination of all these theories lie behind the true chemtrail agenda because it makes obvious sense to the illuminati to make use of all potential avenues instead of just one as it allows them to bombard us from numerous angles which gives us little room for maneuver – which is far more effective from their perspective. littered sky in an apparent artistic way, or in the background of an important scene the sky will regularly feature a number of thick white chemtrails. Disney added a chemtrail like animation to the beginning of their movies to get the new younger generation used to seeing white trails being left in the sky as something friendly and familiar. Advertisements for big illuminati controlled corporations whether in magazine or bill board format often feature a blue sky backdrop littered with chemtrails – yet interestingly no contrails. The illuminati Microsoft corporations’ current windows 7 default login screen features chemtrail like patters on a sky blue background – something people see every time they login and thus get accustomed to and there are likely countless other examples of subliminal programming all of which serve to slowly yet highly effectively get the masses to subconsciously accept the unnatural and harmful chemtrails as being something normal. Despite this subliminal programming however, chemtrails can actually serve as a great way to help awaken people to the illuminati agenda because they are so obvious! It’s hardly some clandestine conspiracy that’s covertly being orchestrated from the shadows – people only have to look up at the sky to clearly see it with their own eyes and if they refuse to see it for its glaring obviousness then perhaps there is little hope for such conditioned minds. In this respect though, one of the illuminati’s ghastly tools of suppression and control can actually be used against them to open the minds of the masses to what is really happening in their lives and more specifically in this case – right above their heads. on and off the spray mid flight which simply doesn’t happen with the natural vapor trails because unlike the chemtrails – they can’t be turned off and on with the flick of a switch. Then, more importantly, aircraft have been seen circling the same areas of sky over and over again laying repeated trails – these aren’t normal flight paths yet many of the aircraft appear to be commercial airliners. Another argument may be that if harmful chemicals were in fact being sprayed into the atmosphere then wouldn’t the illuminati and those alleged of doing it also be affected by it too – rendering the practice pointless. Again on the outset – its a fair point yet if we look for example at the additives in our food that suppress and keep the masses in ill health these don’t affect the illuminati because they know to stay well away from those kinds of foods. In the same way they know not to get addicted to the debilitating drugs they sell to the masses. They may well have designated specific ‘no spray zones’ around the world where they spend much of their time, or they may very likely have come up with a way of counteracting the effects of breathing in the harmful chemtrail constituents that we are simply denied access to, or, depending on how deeply you’re willing to look at the subject – perhaps the ‘people’ behind the spraying may not actually be human at all and so would therefore not be affected by the chemicals in the same way we are. Either way, there are many potential ways they could get around this – as they have done with the other harmful agendas they have implemented in the lives of the masses. Unfortunately it is very hard to do anything to actually eliminate the chemtrailing practice by the elite at the moment due to the fact most aren’t even aware of it and because it’s almost impossible to avoid from below. Therefore, the most important thing for now is to try and make others aware of chemtrails, of their specific purpose, their part in the overall illuminati agenda and how they are anything but natural harmless things that we shouldn’t give a second glance. Once enough people can recognize chemtrails for what they really are only then can something constructive truly be done about it – so we need to spread the word as quickly and effectively as possible. It has now come to a point where the few dominating families of our world not only control the food we eat, the water we drink, the emotional and social side of our lives through entertainment and drugs, and our liberty through their institutions of forceful authority but they have now taken it to the level where they are purposefully contaminating the very air we breath. Apart from outright dictatorship and dominance it really can’t get any more pervasive or extreme than this and so it is of paramount importance that we wake up, assert our rights and freedoms as natural human beings and begin to oust these psychopathic illuminati families from their positions in power at the top of the control pyramid. We must refuse to grant them any more access into our lives or our bodies and as mentioned above – at the moment the most effective way to currently do this in relation to the poisoning of our skies is to simply make people aware of it en masse because if we don’t and these deranged lunatics are allowed to continue to implement their agenda unhindered, then there will surely be no going back – so eyes to the skies!